Star Camp. Note the original Meiners Oaks Ranch House; the Ranch House Restaurant started here. 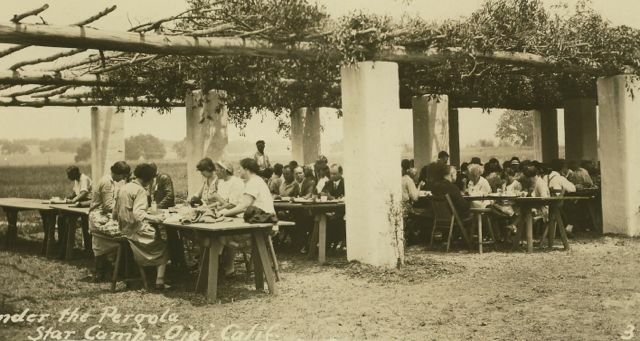 The Ojai Valley has been the scene of many interesting and notable events, but it is doubtful anything has taken place as unique and distinctive as the Star Camp Congress on the meadow near Meiners Oaks in 1928. Not often, in this comfort-loving age, do we see such a gathering–a thousand people living in tents for a week or so, whose sole object was to get away from the pressure of domestic and business life, to be quiet and to listen to the teaching of a modest young man who offered to show them how to end sorrow and suffering, and to be happy. Quietly, and without brass bands or parades of any kind, this great party of campers settled into its city of tents. Little did the small body of theosophists at Krotona in old Hollywood, members of the Esoteric Section of the Theosophical Society, realize that when their secretary, A. P Warrington, was guided to visit his friends, the Rev. Robert Walton and Mary Gray in Ojai, and that when, with their help, he found the Kerfoot Ranch in Meiners Oaks, little did they or Dr. Annie Besant guess that in moving Krotona to Ojai in 1924, they would be preparing the way for these surprising gatherings that would take place during the 1920s. 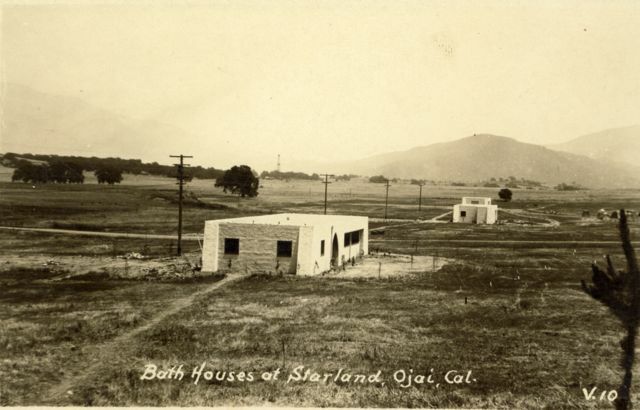 Besant, president of the Theosophical Society, was accustomed to such inner guidance, as in the purchases of Starland, what Oak Grove is today, and the Happy Valley (Upper Ojai property) for a cradle to nurture a new race of human beings. Besant attended the American Theosophical Society Convention in Chicago in 1926. 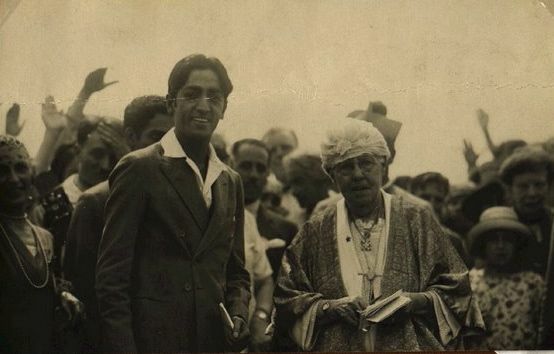 However, her special work was really in Ojai, where her intuition led her to start a new colony and school for the children of the “sixth sub-race” and where Krishnamurti, who referred to himself as “K,” would one day start his school at the west end of the valley. George and Grace Hall moved from Hollywood to live at Krotona in August, 1926, when he became the general manager for Krotona. He planned a subdivision at the east end of the village, to be called Siete Robles, in which he expected to interest most of the would-be Krotona settlers. Krishnamurti and Annie Besant in 1926. Besant and “K,” with their entourage, arrived in Los Angeles in September 1926 and were met at the train station by many of their fellow workers. Her first visit here confirmed that the Ojai Valley would be the future world center for the teachings of J. Krishnamurti. Oct. 1, 1926, in honor of Besant’s 80th birthday, afternoon tea was served at Krotona to 150 to 200 friends. Standing on the veranda of the Krotona Library, Dr. Besant shared her first impressions of the Ojai Valley. Referring to the small group of theosophists coming to Ojai, and the work they would do, she emphasized that they came to live in friendliness and brotherhood. Besant shared her plan to purchase land in Ojai with close associates, and Frank Gerard, a devotee of “K” since 1915, and Fritz Kunz, a dedicated and highly paced member of the Theosophical Society, were the sweat and blood behind what would become the Upper Ojai Valley site. On Sunday morning, Jan. 3, 1927, Besant called her co-workers together to share her vision and thoughts on buying a piece of land in Ojai, among them George Hall, an active realtor and Krotona manager who was pushing for a tract of land adjacent to Krotona, a tract of live oaks that would one day become a sacred spot (the Oak Grove). About 10 a.m., they left “K’s” home at Arya Vihara to see the land on the west side of the Krotona property, since Hall and others thought this piece of land would be the right place for what Besant had in mind. When they came to a high open place on the property, Outlook Point, they all gathered around Besant and expressed their ideas about the site. However, she did not say much, nor did she or “K” seem impressed or much interested in the location, although some 160 acres were bought, later to become the Oak Grove center in Starland, from which “K” would give his dialogues until his death in 1986. Meanwhile, “K” persuaded Besant and the group to look at the Upper Ojai region where there was also a larger tract of land for sale. They liked it very much and got in touch with the owners, and the negotiations began for about 465 acres, plus the oil rights. Before Dr. Besant and “K”, with their entourage, left for Europe in April, 1927 (Besant never to return), she appointed George Hall her representative in all matters in Ojai. She appointed the Board of Trustees for the Happy Valley land, all Esoteric Section members, to manage the property according to her wishes and instructions. In May, 1930, Happy Valley was incorporated as the Happy Valley Foundation. April 15, 1928, “K” arrived back in Los Angeles in the company of Baron van Pallandt, a Dutch nobleman of Ommen, Holland, Mr. Tristram and Mr. Prasad, professors of physics at the University of Madras. Among those greeting them were Mr. and Mrs. D. Rajagopal, chief organizer, Order of the Star; Dr. and Mrs. John A. Ingelman, national organizer for the United States; Marie Russak Hotchener, editor of The Star magazine; Louis Zalk, Ojai camp manager; James Montgomery Flagg, the illustrator, also Bishop John Tettemer of the Liberal Catholic Church, and many others who were especially devoted to K’s teachings. New additions to the garage building were now under construction at Krotona Institute to make storage for seven cars. Also being installed was a private 280-gallon gasoline station with pump for the residents’ use. Since members were coming from all over the world to attend the Star Congress, they wanted to stay at Krotona, but the accommodations at Krotona were still very limited. As for the village of Ojai, it would cost no less than $8 per day, with or without meals, and these also were limited. Starland camp, west of today’s Taormina property, progressing under Hall’s direct supervision, with the guidance of Zalk, construction began immediately with three bath houses and a cafeteria to make a success of the planned International Star Camp in May, 1928. The gathering included about 1,200 people (11 nationalities besides American were represented). Ojai had thrown open its doors to the world. A building boom was soon on in the Ojai Valley. Meiner’s Oaks help a special interest for most of the followers, who were all buying lots within a short walk of Starland. The opening meeting of the Star Camp 1928 Congress, the Campfire, was held on Outlook Point, overlooking the surrounding countryside. After introductory music, “K” stepped forward and touched the torch to the campfire, chanting an ancient Sanskrit hymn as the flames leaped skyward. Outdoor dining at Star Camp. On August 3, 1929, at the Ommen Star Camp in Holland, in the presence of Annie Besant, “K” officially dissolved the Order of the Star and the Star Camps around the world were opened for public use. The management of the Ojai camp made an announcement that the property was to be made available for the use of other organizations all over the nation who might desire such a location and such equipment for convention purposes, except for the time when “K” would occupy the Oak Grove each May for his dialogues. Around 1975, the Oak Grove School was started adjacent to the Oak Grove. From the Ojai Valley News, July 28, 2000. Previous post: Postcard: Hanging Rock — A Trysting Place.